The College of Design offers the Rome Program to fourth-year students in the Bachelor of Fine Arts in Graphic Design degree program. This optional course of study is offered annually in the fall semester. Participants engage in a design studio and in seminars that emphasize the unique culture and environment of Italy and of Western Europe. 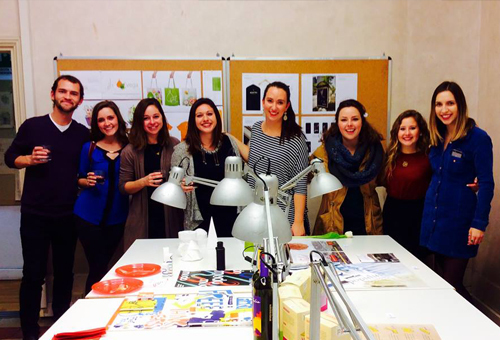 The Rome Program offers what is for most students a first-time opportunity to travel abroad and experience the physical and cultural settings of major works of graphic design overseas. Students attend classes at the College of Design’s studio facilities in the historic center of Rome at the Palazzo Cenci-Bolognetti, a 16th-century building located in the Piazza delle Cinque Scole near the Tiber River. ISU faculty members accompany students abroad and provide instruction for the majority of classes offered in Rome. Graphic design students interested in going to Rome must take a one-credit study abroad preparation seminar during the spring semester prior to studying in Rome in the fall.